I read this article and found it very interesting, thought it might be something for you. The article is called Tibetans Sentenced in Central Tibet in 2018 for “Inciting Separatism” and is located at https://tibet.net/2019/01/tibetans-sentenced-in-central-tibet-in-2018-for-inciting-separatism/. In 2018, China has sentenced 25 Tibetans in the central Tibet, the so-called Tibet Autonomous Region (TAR) under charges of “inciting separatism” and endangering “national security,” reported the state mouthpiece Global Times. The TAR high court presented the information in its work report last weekend. Announcing his work report to the regional Party Congress, TAR Chairman Che Dalha (Chinese: Qi Dalha) said, “Tibet has firmly curbed and cracked down on secession, infiltration and sabotage activities by hostile forces at home and abroad,” referring to His Holiness the Dalai Lama and Tibetans and supports outside Tibet. In February 2018, the public security bureau of TAR issued a circular listing “22 illegal activities,” three of which directly mentioned the “Dalai clique” and “hostile foreign forces”. Like these 25, Tibetans calling for freedom in Tibet and expressing reverence to His Holiness the Dalai Lama have often been punished for “inciting separatism,” a criminal charge loosely defined and more so broadly misused against Tibetan dissents. One example is the well-known case of Tashi Wangchuk, the Tibetan language rights advocate who expressed his opinion about the Tibetan people’s right to their language, for which he was sentenced to five years on the charges of “inciting separatism” by a Qinghai court last May. 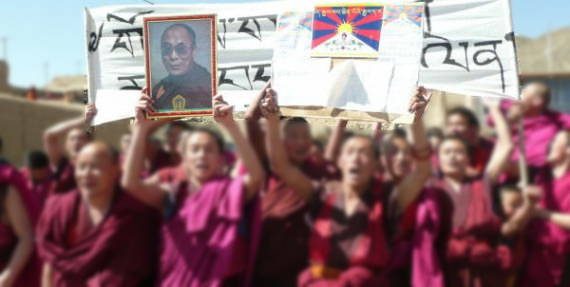 In central Tibet or the “Tibet Autonomous Region,” protests against the Communist government’s policies erupted despite rigid monitoring and constant watch by the security personnel. In April last year, the TAR authorities manhandled and detained over 30 Tibetan villagers in Driru county, Nagchu prefecture for opposing mining of the sacred mountain Sebtra Dzagen. Prior to this event, Karma, the village head of Markor was detained when he refused to give his approval to the mining project. Despite repeated attempts, due to total clampdown on phones and other communication devices, Karma and the Tibetan villagers’ well-being and current condition remain unknown till date. The concern is that the actual number of Tibetans sentenced in the past year would definitely be higher than the Chinese authorities’ claims.